Blondie and Brownie: Why is McDonalds So Much Better Abroad? Just glancing at the "Treats" menu you can already spot the Canadian influence. Blueberry Maple pie? Never seen that in the states. Their treats also had a bit of a European flair with a choice of mint and caramel Aero McFlurrys. Unfortunately I just got this one measly photo before I was busted by the McDonalds equivalent of the mounties. But I did notice that their regular fare included grilled or fried Chicken McMinis topped with pesto sauce, "zesty mango" or done up Spicy Thai-style and served on a mini baguette. I don't know about you, but that at least sounds way more interesting than the standard grilled chicken sandwiches served at our local McDonalds. Almost makes me want to go back to try them, though it's hard to imagine it topping the Crocchette con Spinaci e Parmigiano Reggiano that I got from the McDonalds in Naples. Have you had any excellent McDonalds experiences abroad? A few months back I was in Paris. After visiting The Louvre, my boyfriend and I hit up their food court, I was in desperate need of coffee. They had a McD's and a separate McCafe. Their McCafe had all sorts of french pastries and MACARONS. I got one in every flavor they had and they were awesome. I wish we had that here in the states. I also tried a McDonalds in Tokyo and they have way better burger selections than we do. Its not fair. I was in Paris for a few weeks and every McDonald's I passed I went into to check out what might be different. The most obvious difference was the McCafe. Their Macaron cookies, delicate French pastries, shots of espresso.......nice if they would do that in the States as well!!!! germany- mcdonalds with a PINT! and argentina was pretty good, altho i believe i was in a bit too much of a state to figure it out! 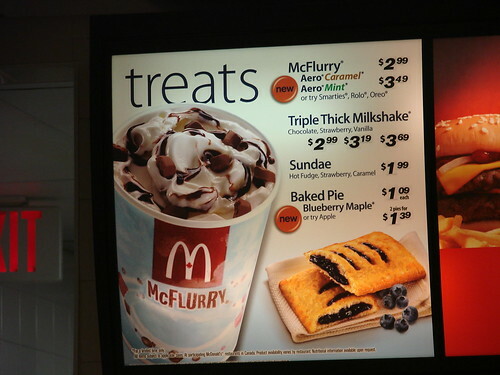 they also have the mccafe in argentina, it's like their version of a starbucks. their starbucks is pricey as tho! Five years ago, my mother and I arrived in the dead of night in Hong Kong after 15 hours of travel. Famished, nothing was open but the lone McDonald's nearby the hotel, so we reluctantly gave in. To my unworldly and less-traveled sensory delights, I saw on the menu grilled duck wraps in the style of the American grilled chicken wraps(but obviously modeled as mushu duck), sweet corn kernels served in a takeaway cup, and most memorable of all, red bean and mango soft-serve ice cream! It must have been the only time in ten years I didn't feel guilty for eating at McD's. Went to a McDonalds in Italy back in February of 2008. Delicious and I almost died. It was a couple blocks from the spanish steps, we were tired and needed a quick snack. The McCafe there was amazing...the pastries and even GELATO. I was in heaven. Plus it wasn't greasy or drenched in fat. Definitely was a great experience. I live in Australia, and I gotta say, our McDonald's is pretty damn good! They've tried to make it really "fancy" here for some reasons, so now there's heaps of deluxe burgers...like Angus beef burgers with gourmet salads and stuff. They're really good. I actually really like a lot of the stuff on our Australian menu - it's generally got a lot more of a "fresh and healthy" focus than many of its international counterparts. We have fresh fruit and yoghurt on the menu and stuff - I think Australians like to pretend to themselves that they're being healthy and are generally pretty snobby about food. I went to McDonald's in Japan and that was awesome...tasted so good. Everything tasted super fresh (i.e. hadn't been sitting under a warmer for hours) and the stores were always immaculate. I also went to McDonald's in the Republic of Macedonia and was freaked out when they didn't have FRIES on the menu, but had TOAST and PIZZA! What the...? !